Last week, a family friend brought over some absolutely delicious aloo parathas for us. Tri and I were wondering what to eat for lunch today, and I was feeling a little sick of white rice, so we decided to try out this type of Indian roti. Kathmandu Valley dwellers often eat daalbhat for their morning and evening meal. This consists of bhat (rice), daal (lentils), tarkari (some kind of vegetable or meat dish), and maybe some achaar (pickle). They occasionally eat roti instead of rice, and because it’s often made with whole wheat flour, doctors recommend it to people who have diabetes. Neither of us knew how to make this type of roti with potato stuffing, so we turned to Manjula’s Kitchen, a blog that publishes some great South Asian food recipes. I started with the pitho (flour) and gradually added water to make it into dough. Meanwhile, Tri boiled some potatoes, mashed them, and added khursani (hot pepper) and jeera (cumin). The recipe also called for cilantro, which would have added lots of flavor, but we didn’t have any around. Tri rolled the mashed potatoes into little balls. Then I separated the dough into about 10 parts and flattened each one. We put the potato ball in the middle of the flattened dough and then folded up the sides. Although I made some salsa to eat with the roti, we quickly reverted to maha (honey) and ghiu (clarified butter, the equivalent of Indian ghee) as our topping. Potatoes, butter, and honey are a surprisingly tasty combination. The paratha we made weren’t as good as the ones our friend brought us last week, partly because they were a little too dry, but they hit the spot. 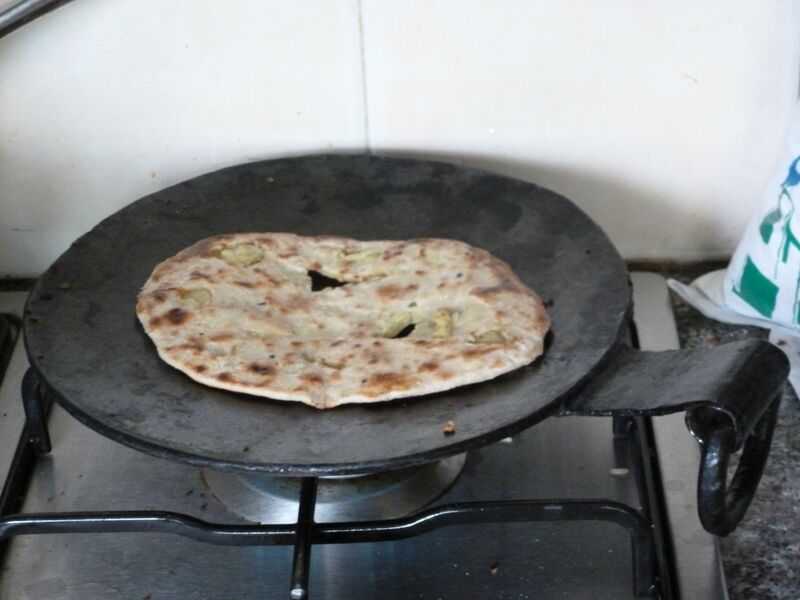 This entry was posted in Food and tagged Learning to Cook, Nepali Food by nepali jiwan. Bookmark the permalink. There’s a type of food called bujiya (also called murai) that’s basically just puffed rice. I’ve eaten it with taas before (mentioned here: https://nepalijiwan.wordpress.com/2011/09/13/another-post-about-cars/). I’ve never eaten it fried, though. There’s also churra, which is flattened rice, and sometimes people do fry that with onions, garlic, and spices as a snack. Neither of those foods really fit your description, but what you’re describing could be a dish that’s part of the Sherpa cuisine and possibly not very common in Kathmandu. I’ll ask around, though, and see if I can find out more. I’m sorry I couldn’t be of more help!